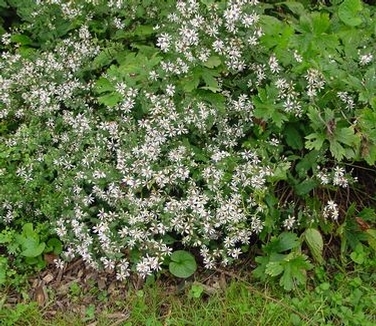 'Eastern Star' White Wood Aster is shorter than the species and has dark burgundy stems to set off the white daisy-like flowers better. 'Eastern Star' blooms in September and October, and tolerates poor soils. An introduction from Canyon Creek Nursery from a plant from coastal Rhode Island (New name is Eurybia divaricata). PRN Preferred: More compact than the species, flowers even in dry shade.